They won their fourth straight game since coach Jason Kidd was fired by beating the Philadelphia 76ers 107-95 on Monday night. And now they’re getting forward Jabari Parker back in a few days. The 76ers didn’t have All-Star center Joel Embiid, who sat out to rest. Milwaukee has also beaten losing teams in Phoenix, Brooklyn and Chicago under new coach Joe Prunty, the assistant who took over on an interim basis after Kidd was fired last Monday. ”Maybe we left them in Oklahoma,” Saric said about the off night from the arc. He missed all eight of his 3-point attempts. 76ers: Embiid is set to play in back-to-back games for the first time when Philadelphia hosts Miami on Friday before visiting Indiana the next night. The 7-foot center has had an extensive injury history that includes foot and knee surgeries that have limited his ability to play since he was drafted third overall in 2014. Elected a starter for his first All-Star Game, Embiid scored 27 points in 35 minutes during Sunday’s loss at Oklahoma City. He is averaging 23.6 points and 10.9 rebounds per game. Bucks: G Malcolm Brogdon returned to the starting lineup after a two-game absence with right calf soreness. He scored four points in 21 minutes. 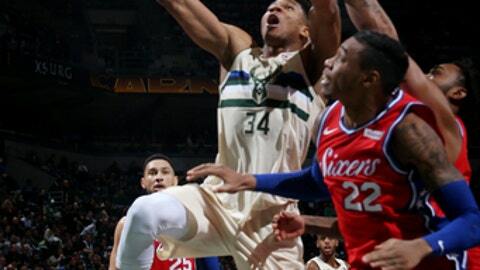 … G Eric Bledsoe did not return after playing the first three minutes. The Bucks said he was available, but had been dealing with a sore left ankle. ”The bottom line is we gave it a go, the effort was there in terms of trying to go out and play, and obviously he couldn’t go,” Prunty said. ”He does so many little things out there for you. It’s not only getting you into the offense, it’s knowing the offense and where guys can be successful or setting screens,” Prunty said. ”He’s definitely a freak. He’s long, athletic … he gets to the line a lot. He’s gifted.” – Simmons about the 6-foot-11 Antetokounmpo.